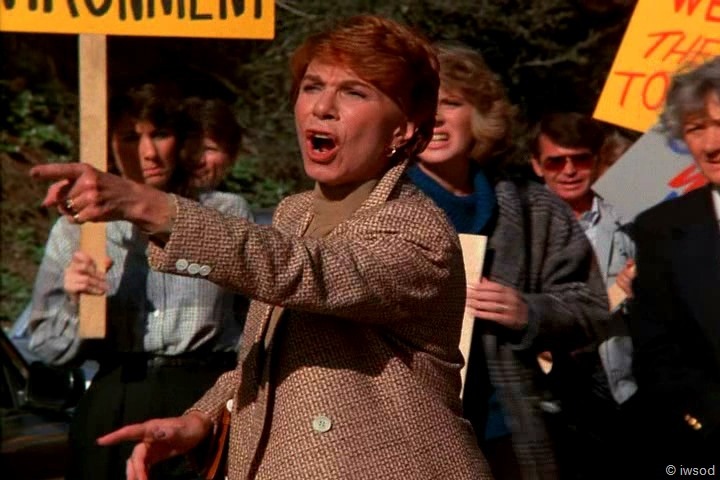 8/11 Season Two, Episode 23: Vigilante Mothers- Scarecrow and Mrs King | "Just walk with me.."
The next day, Amanda shows up to the MSE meeting to find they’ve already left [LOL wasn’t she um the leader? guess not ] She finds the place is empty.. except for super frumpy Mrs Dukane. Hey we saw this outfit on Amanda in Burn out remember?? very randomly for a scene lasting less than a minute?? I wonder if they were filmed together? Amanda: Where is everybody? 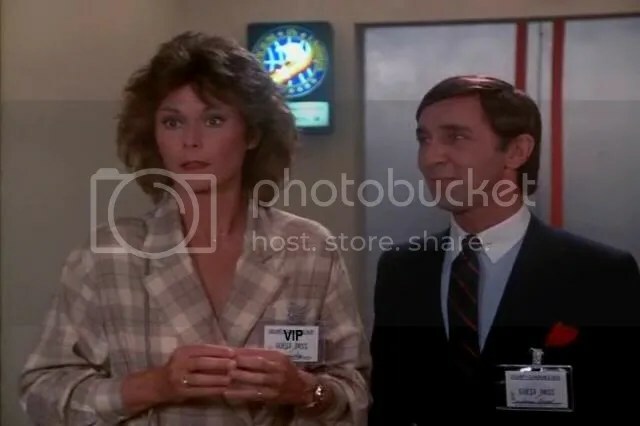 Mrs Dukane: Well, they’ve been here and gone. They left early, they wanted to be sure to catch the midnight and the day shifts at the plant. 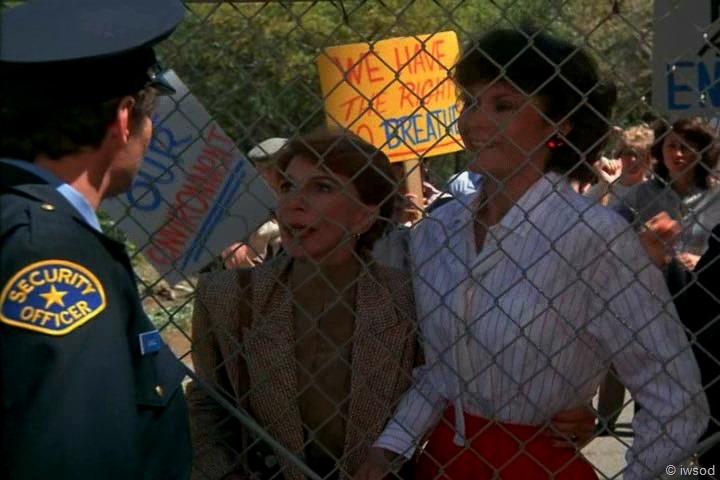 Mrs Dukane: Um, uh, the Bethesda, the Ordnance Lab. On to the Bethesda labs..Gee and wait a minute.. that’s where the X-12 crystals are!!! What a coincidence!!! Amanda takes off in a hurry.. and phones Lee.. Next thing we see Lee hanging up at IFF from Amanda’s call.Oh my.. he has on the blue shirt with no tie again.. me lovin that look!!!! He looks so good in this episode! Lee rushes in to give Billy this exciting news! why.. it breaks the case wide open! I am pretty sure I am not suppose to be laughin through this scene.. but.. I am..this is smk plotting gold!! Lee: Billy, that was Amanda. 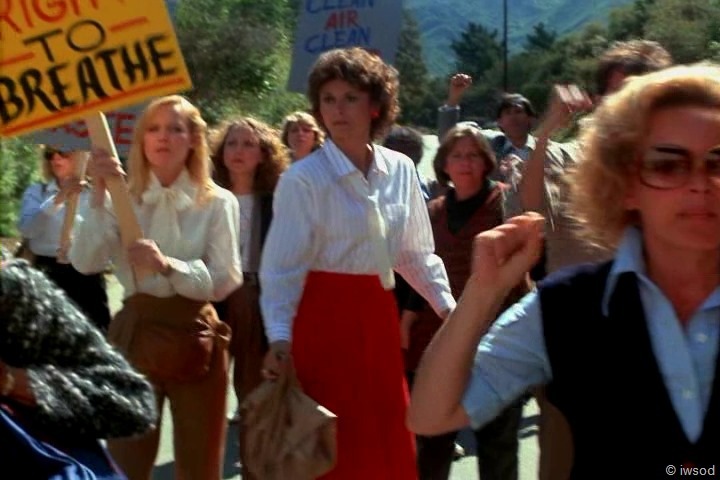 She says the women are marching on the Bethesda Laboratory. Yeah! so exciting!! air punch Billy!! Err so what?! [they just figured out someone is going to steal the X-12 crystals from the Bethesda lab! whooo!! 😕 which they knew at the start of the episode!!! whahahahaaa! 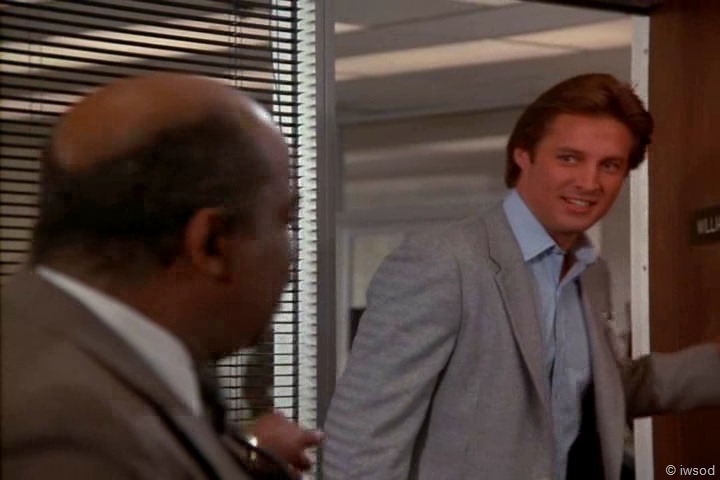 Lee leaves in a hurry..and we see Billy with a self-satisfied grin.. now they can finally protect the X-12 crystals now they know where they are.. oh wait.. no .. something isn’t right here??!!! oh whatever! The demonstrators are creating chaos.. 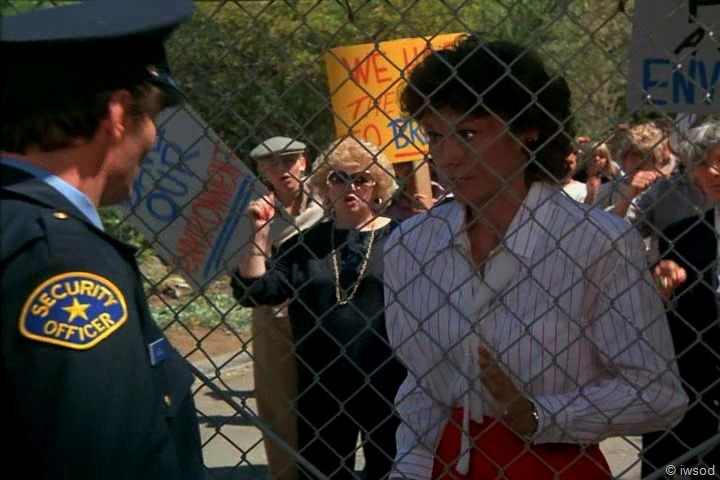 Many women are there including Jean and Mrs Courtney..
Mrs Courtney: Okay, everybody, here we go! And remember, this is for our children’s future! Right! Jean: Okay, let’s go! Link arms! And show our solidarity! Let’s go! Mrs Courtney: Here we go! 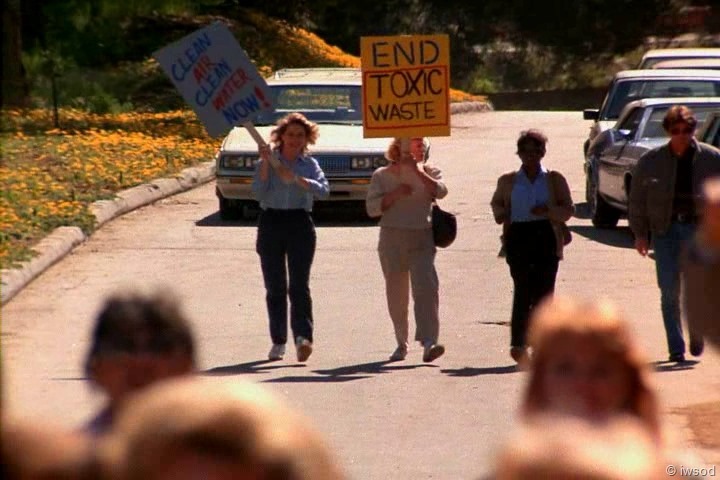 The security guards see the group approaching and call to their boss, Crawford, for instructions..
– what pollution? has the lab created pollution? I’m still utterly confused.. how about you? 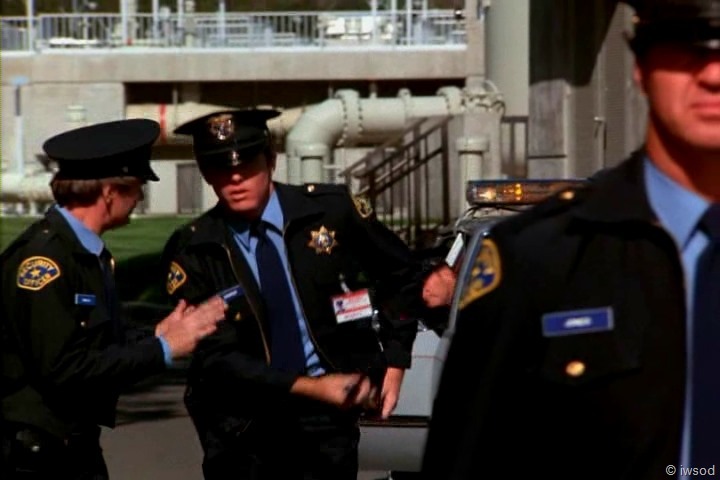 Ahh we see Amanda’s station wagon pull up.. and the scene cuts to inside the labs. We see Dr Fletcher is in the lab working.. As his co-workers move over to the window to check out the demonstrations, Fletcher is able to make his way to a room holding the X-12 crystals..
Oh wait!!!! 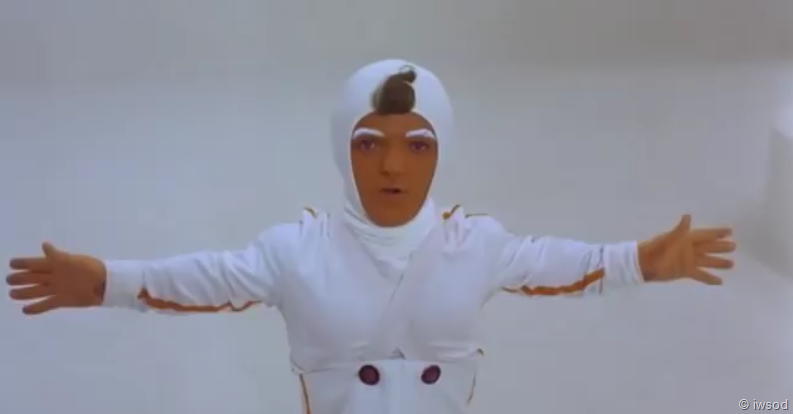 I knew there was something weird and unsettling about those lab outfits… they look like oompa loompas!!!! 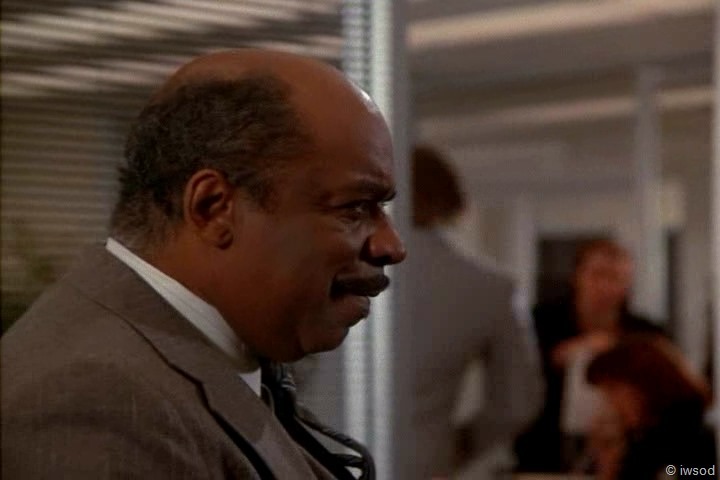 So I guess this explains why Fletcher is allergic to chocolate and now sticks to the everlasting gobstoppers – being paid in Cacao beans all those years left him very bitter Get it? [Hey Fletcher.. the song says ‘Oompa loompa do pa de dah, if you’re not greedy you will go far!’] Oh dear.. I’m distracted by moral lessons and chocolate..
Moving on.. Amanda is making her way toward the angry suburban mob! Security reinforcements arrive at the lab gates. Crawford says they are not to use force.. good to know..
they are to be polite, and not let them in. Man, they don’t take this group very seriously huh..
Back in the lab and Oompa Fletcher exits the secure room where the crystals are kept. 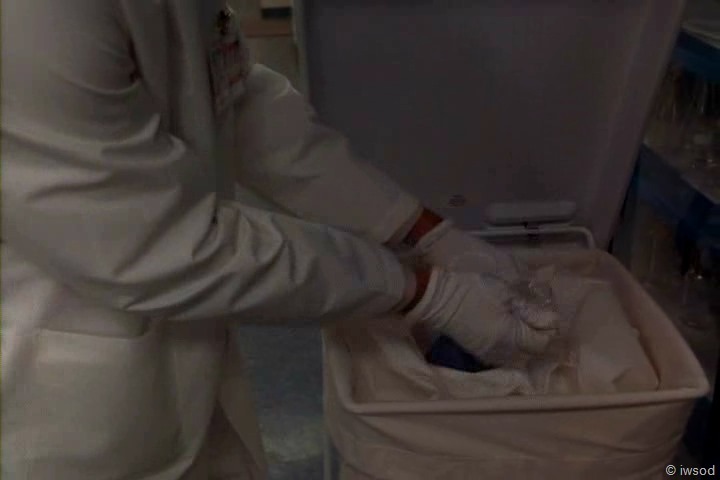 All the other staff are still distracted at the windows, so Fletcher is able to easily open the laundry hamper and slip the crystals into a lab coat pocket. [Too funny, you’d think he would have had them in his coat pocket and changed coats to put the crystals in the hamper – nooo! tee hee nothing suspicious looking about opening the laundry hamper for no reason! We can see the view down to the gates.. Amanda’s car is parked in plain view there on the side of the road. that will be great for when Lee gets there.. He’ll spot that! right?! A Guard tells the other guards: Crawford says to ask them politely to leave. Under no circumstances, I repeat, under no circumstances are we to use force. Yes we needed to hear that three times.. not..
Amanda joins in the chanting.. 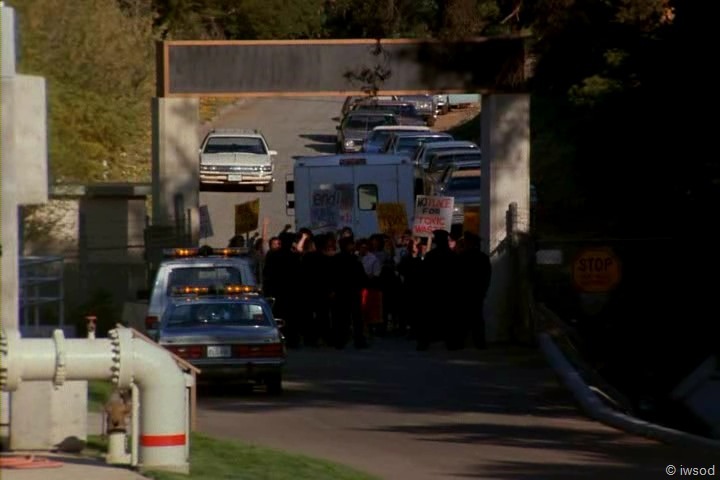 The laundry truck is seen exiting the lab through the gates. The guard calls out: Come on, ladies! Come on, please! Now watch it! As the laundry truck tries to work through the crowd, I think I can just make out that it is Castille at the wheel of the Laundry truck. 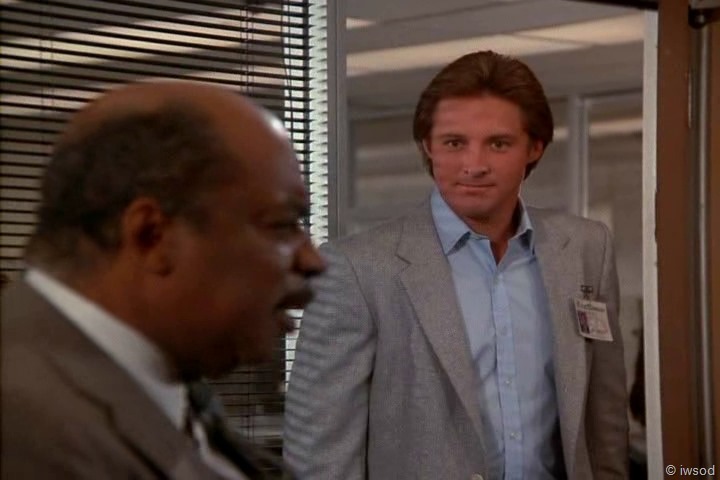 Inside the lab, Fletcher makes his way over to the window..
Dr Mallory: I don’t know. Looks like some kind of demonstration. Back at the gate, how is the laundry truck suppose to squeeze past Amanda’s car there???!!! is this Amanda’s idea of extra security?? [which the agency should have had there from the beginning of this episode anyway??!!! I mean come on- Castille is driving the flippin truck!!! They could have distributed his picture at least! Heck.. The agency deserves to have these crystals stolen. Oh wait.. whose side am I on? what am I saying?? these silly plot craters are messing with me! 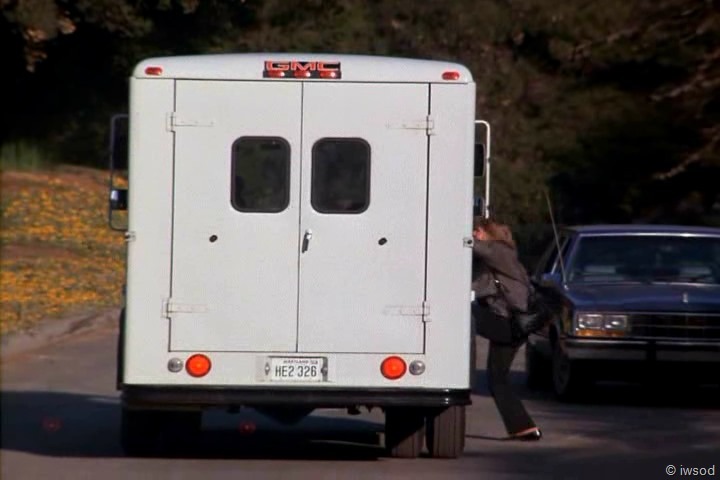 Amanda sees Jean sneak away from the crowd and into the laundry truck..LOL!! she’s not very subtle is she! Check it out!!! All of Amanda’s fantastic plans to block traffic with her car parked there came to nothing! this laundry truck is MAGIC!!!! It has made Amanda’s car evaporate right before our eyes!!! Gosh.. can X-12 crystals do that? 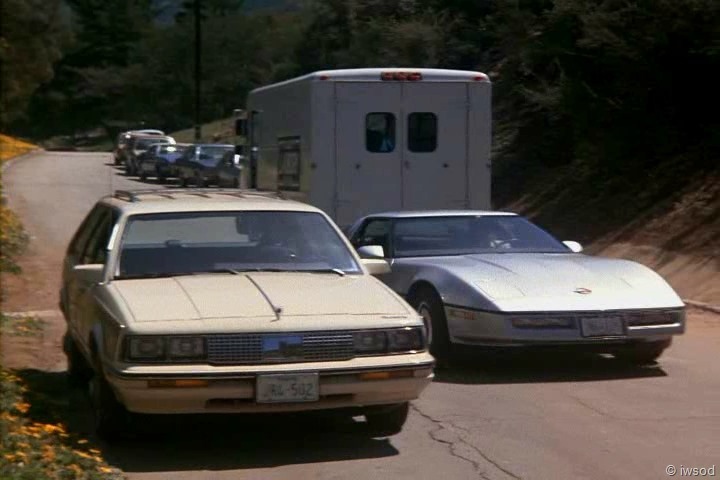 Ohhh now we see Lee’s car arriving..
Hello? Leee?? That is Amanda’s car- right there!! You might wanna umm you know talk to her?! Sheesh.. If Lee ever did that – the show would be over in five minutes huh! 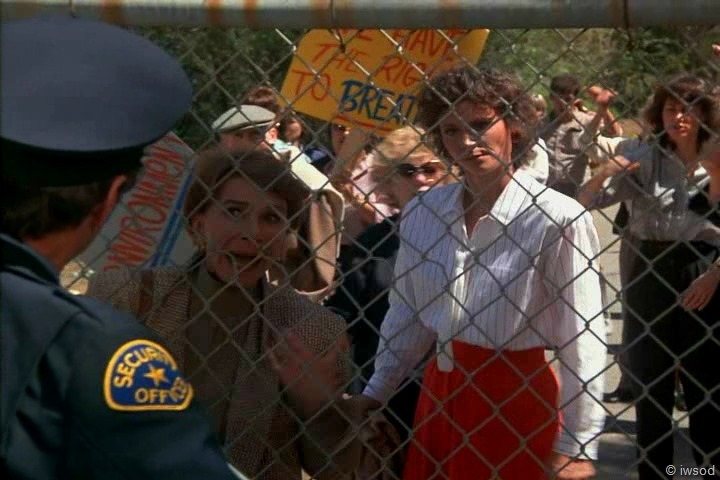 Amanda struggles to the gate through the protestors but is not in time to stop Lee. I guess he couldn’t hear her anyway – but he should have been looking for her! booo! Oh and why didn’t any of the MSE members recognise him – Hey! Mr Sampson!!! Join us!!! He has a badge?? he gets to go in?? but no.. nothing! Amanda: Excuse me, I need to get a message to somebody in the lab. Guard: No, sorry, lady. No crazy housewives get through here. Amanda: Listen, this is very important. Guard: You’re with them, aren’t you? Guard: Do you have some official ID? Guard: I thought not. Look, lady, why don’t you go home? Bake a cake. Amanda: Oh, that’s a terrible thing to say! … I-I can’t believe it. Are you married? I bet you are. I bet you have kids, too. If you do, you-you should be on this side of the fence with us. We’re fighting for your lives, we’re fighting for your kids’ lives, as well as ours. Don’t you understand that?! We’re not your enemy! Amanda gets in her car and follows the laundry truck which is just disappearing around the bend.. phew! Go Amanda!!! I’ll finish up here for the moment!! There hasn’t been much relating to Lee or Amanda in this section..so I’ve commented throughout! Love when the guard asks Amanda if she has official ID and she very flatly says: No. Yep.. this is getting really old! I think it’s getting old for Amanda too.. Time for Amanda to be officially something! Amanda is in this outfit again.. that she wore for less than a minute in Burn Out.. Hmm I think they filmed this and Burn out together.. MBFriends too – I think the filming of all three crossed over and there are many moments where Amand’s hair is suddenly much longer! Though I’d definitely go with BOut first because Amanda wears the diamond pendant necklace again for the first time in ages, for only half that episode.. So still tossing up the order of MBFriends and VMothers! What’s your thinking everyone?? 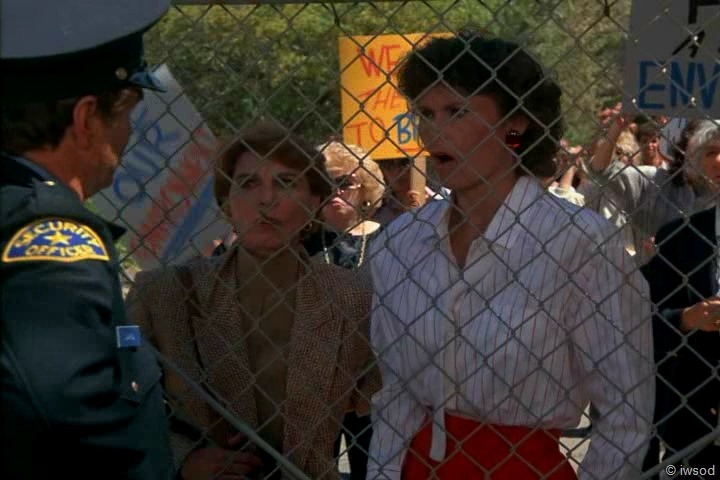 Here at the protest, the guards seem to me condescending to the ladies and crazy housewives. Again, we see women being shushed and not listened to- fighting to make themselves heard. About what I have no idea because none of it makes sense to me – but I at least understand the principle – just because they are mothers or women doesn’t mean they shouldn’t be listened to.. Mrs Courtney’s argument is that they fight for their children’s futures- another group in the community which have no voice. Hmm I have no idea what this all means though! Make of it what you will! I do think in some ways SMK was ahead of it’s time.. raising the environment, women’s issues etc.. good on smk! That’s it for now! Can’t wait to hear your ideas everyone! byee for now! Ah, good ole Mrs. Dukane. I didn’t think at first it was the same actress as in ACA, but I went back and checked and the voice sounds the same, so I’m thinking it is the same actress. Of course I could have checked IMDB, but that would have been too easy. I’m thinking we may see this actress again in an S4 episode, but I’ll hold off and try to remember to bring it up then. She is not Mrs. Dukane in S4. Ugh – Mrs. Over the Top Courney. Geesh. I do like that she gives the guard heck after he jerkily tells Amanda to go home and bake a cake, but that’s about it. I still think she looks like Dotty. If I only had time to go get two images to show side by side here. I’m still voting for MBF before VM. I’ve seen nothing that makes me think MBF should come first, but many things that make me think MBF comes first. How does Fletcher think he can get away with this? Really! There are only two people with access to the crystals, so he’s bound to be half of the suspect list. 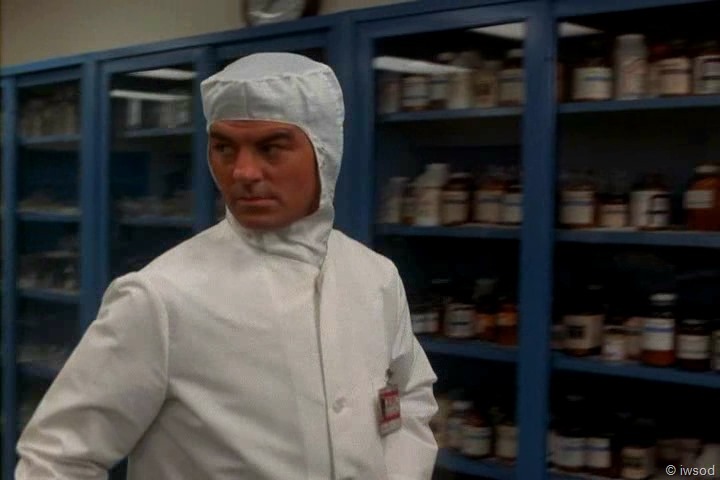 And, may I humbly point out that if Lee had been shadowing Fletcher (that was his job, actually) he wouldn’t have arrived at the lab AFTER the crystals were already out the gate? OK-so here is how I attempt to fill in the plot crater. They know what lab the crystals are at. They know some of who is involved (but not everyone until Amanda sees Jean leave with the laundry truck). The problem is that they don’t have the proof. 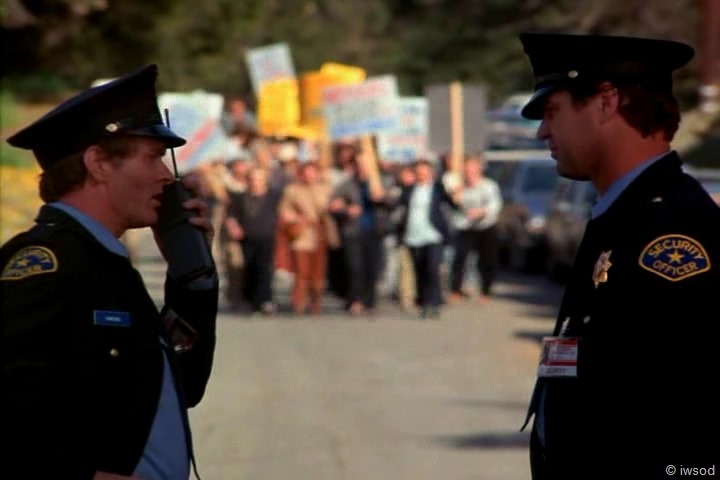 Once they find out where the group is protesting, they realize that will be the distraction, and Lee is supposed to catch Dr. Fletcher red handed. 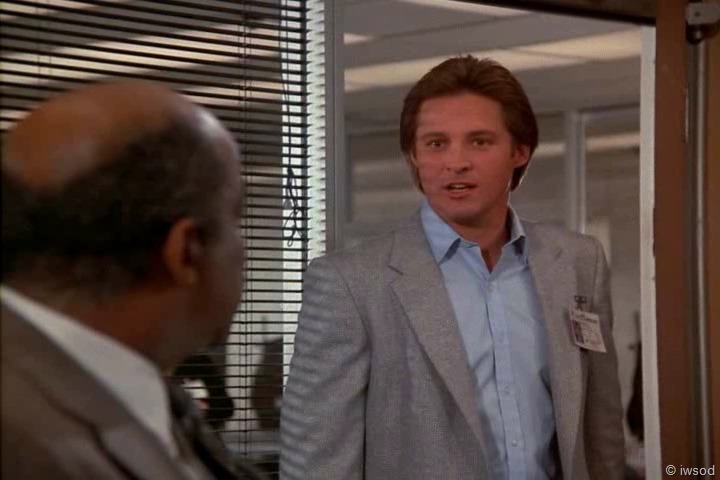 I guess then the idea is to get Fletcher to help the agency catch Castille and testify against him. Otherwise, they would have just moved the crystals to another location to keep them safe (again episode over quickly). As far as the ID’s, I assume that one is his federal ID and the other is probably just his driver’s license. 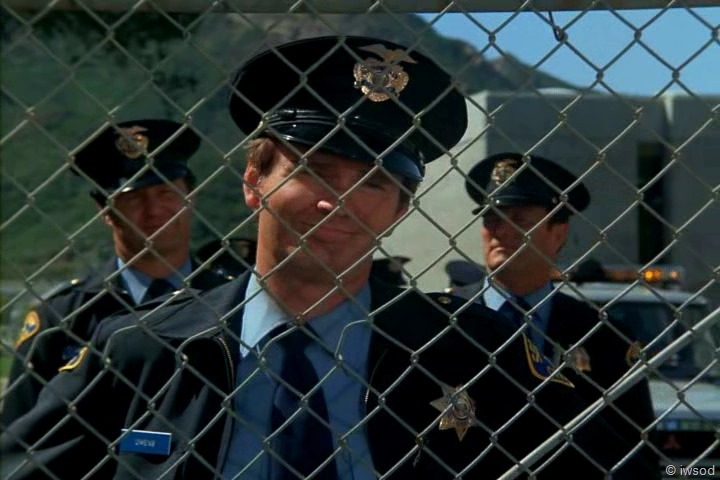 The guards comment about the women going home and baking a cake, also plays into a line in Mr. Brand, so again, this is the season finale and Mr. Brand is the opening episode. Since this was not a great episode as a finale and Mr. Brand is also not a favorite, the network couldn’t let Mr. Brand be the first episode after the summer hiatus. And I agree that Amanda needs an ID and an actual badge (so she is not always wearing the guest badge). Every time I hear that “go bake a cake” line it makes me think of the cake baking scene for the Mother of the Year Award. That is what women are supposed to do to prove their worth? Bake a cake? If that’s the case, I’m in trouble…LOL! 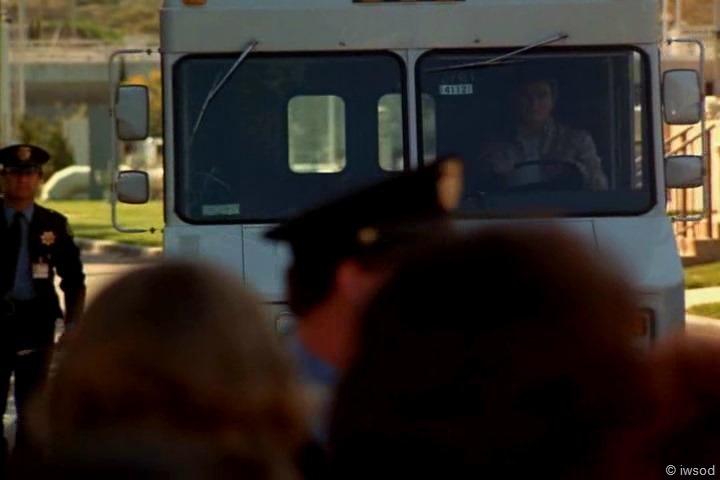 If they wanted proof they should have stuck close to Fletcher to watch him take $$ off Castille.. and later take the crystals and hide them – rather than let Castille just drive out of the labs with them. Aie!! lol yes ‘episode over too quickly’ imho explains a lot of the plot holes in this episode… very true LAAL! it seems to me in order to have the plot work the agency has to be portrayed as inept.. and that is never a good thing! Whooo I look forward to hearing how this plays into Brand. Ah yes I can guess the bit you are referring to.. makes this episode worthwhile!! I’ll look forward to exploring it when we get to Mr Brand. I think it’s a shame Brand wasn’t the season opener.. I really like it.. but I do see why they changed it- it’s not ALLA! – also the question of did Joe even want children that early in the marriage? – not to mention the time, energy and stress involved in trying to find paid employment. Amanda also made sure she kept up a positive relationship with Joe – it was not an acrimonious break-up. She possibly internalised a lot of her own hurt and issues to accommodate this continued positive relationship both to minimise the stress of the break-up on both of them and to avoid tainting Joe’s image in the boys’ eyes. How did she end up with a self-absorbed guy like Dean? From what we saw of him, his life seemed to be all about himself. When she asked him about if the Weather Bureau was hiring, he just made a joke about her marrying him. Her issues were seemingly light-weight to him. From what we saw of their relationship it seemed to be all about Amanda being interested in Dean and taking care of Dean, but little or nothing of Dean really investing himself in her life and her concerns. Even Dean’s mother was keen to make sure Amanda was good enough for her precious son to marry. As we know, Amanda only took child support from Joe, not alimony, which in itself is interesting. I have thought about her reasons for doing this but wonder what others think Amanda’s reasoning would be. I think despite her loss of confidence she wanted to know she could make it on her own, she possibly felt that it wouldn’t be fair to Joe for him to continue to support her after the divorce, and maybe lingering guilt that some sort of failure on her part was at least partially responsible for the break-up. I really like the way you have laid out so much of Amanda’s back story, Kiwismh. I agree, Amanda does have plenty of hurdles herself to overcome. She is a brave woman and getting involved with the Agency and her growing relationship brings a lot of healing to her. Time and again she has had opportunities to rise to the occasion and overcome obtsacles and grow and she has. I know the women in the episode can be difficult to watch, but I do like the way it show what kind of a woman Amanda has become. I tend to think that in a way this episode tends to compare Jean with Amanda. 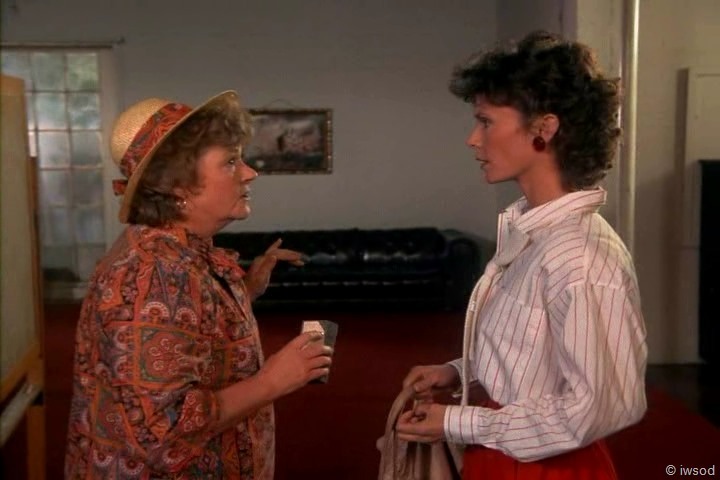 If indeed Jean is a single mother looking for purpose and excitement in her life, then she is quite like Amanda was at the beginning of the series. Who do they ultimately decide to trust and how do they handle their hearts. Amanda has always been wise with her heart when it comes to Lee. Not sure if she was wise with Dean or Joe. I think Amanda didn’t take child support for two reasons. One is that she wanted to prove something to herself and to others. Alimony was definitely on the downward trend at this time … not going away, but certainly capable women were expected to support themselves, not rely on the husband to do it. And we know Amanda is a capable woman and it is very much in character that she would challenge herself in this way. It also reflects a relationship with Joe that was not acrimonious (as we have noted a lot before). Of course the other reason is an SMK reason — SMK needed Amanda to live on a tight budget to keep that plot line going. And it works for me. I remember my mother extended the hanburger with filler and the milk with dry milk supplement all to keep a handle on the budget. We never did fast food and only ate out on special occasions. Moms who did join the work force were challenged to prove their decision was reasonable by showing that they could still manage all the home responsibilities and all the work ones as well. I was considering that as I watched TFTime yesterday, Amanda’s first foray into the working world. What does she do at the end … races home and gets the dinner ready for Dean, flowers and everything, as though she’d been doing nothing else all day. I’m glad those days are past. I don’t do fast food, but my dinners have never been gormet. Tuna, pancakes and bacon, and eggs for dinner got me through many a hectic work day. I touched on this before, but I think that it has everything to do with self-reliance, inner strength, and belief in ones self. I made the mistake last time of bringing up the word “pride”–which wasn’t quite what I was getting at. We know that Amanda has great inner strength. That doesn’t stop her faltering at times, or sometimes–temporarily–losing her belief in herself, but that’s a human thing… and something that would have been stronger in her in the wake of the divorce. Divorce rocks your very core and makes you question yourself. Refusing alimony is one way of empowering yourself–standing up for yourself and believing in yourself. “I can do this.” Proving to yourself that you’re capable; quieting the inner voices that in your weak moments say you’re not, even though you know deep down that you are capable. Being self-reliant and not being beholden to another–especially when that other is no longer your partner. Amanda is strong and is a proven problem solver; she would have believed in herself to find a job (e.g., at Honeycutt Typewriter [gag]) and pay the bills. Though the money issue comes up a few times, I don’t believe the boys suffered. (Empowering herself, while possibly seeming like potentially hurting the boys by not having the money, helps her be stronger and maybe a better parent?) They were very loved, they just weren’t spoiled with fancy toys–not a bad thing, hmm? I wasn’t really thinking ahead to the S3 episode TWWH when the divorce comes up again. I was more thinking back to the S1 episode The Mole when Amanda mentioned she didn’t take Alimony how it all fits in the context of her marriage and divorce, and then in what ways she has grown in the 2 years to this point since becoming involved with Lee and the Agency. I thought I would just throw it out there for discussion again, especially in this segment of the episode when really all else we have to think about is how big the plot craters are and why parts of this story just don’t make sense. By the way, kudos to all out there who are doing their best to explain the plot craters and still make the story work. I’ve thrown up the white flag on this episode in that respect – I can’t make it work in my brain without a major re-write. I think Amanda not taking alimony may have been a sign of the time. I’m no expert, but am thinking after the feminist movement and the fight for women’s rights that Amanda/KJ was perhaps making a statement that I am a strong woman who is capable of taking care of myself and my family. Growing up I remember thinking that most happy ever after love story movies when I was a kid in the 70’s made me think that once a woman got married her husband took care of her and she took care of the kids. That may be a bit to general, but that was the idea generally presented that I remember. I think my own real family life was like as well. I saw Frozen this past weekend and was surprised at the story. SPOILER ALERT I think it was the first Disney ‘princess movie’ where the girls took care of themselves and didn’t wait for the guy to come save them. It’ll be interesting to see how much more things have changed in 20-30 years when this group of little girls is raised with strong, capable role models that don’t have to rely on ‘their prince’ to come save them. 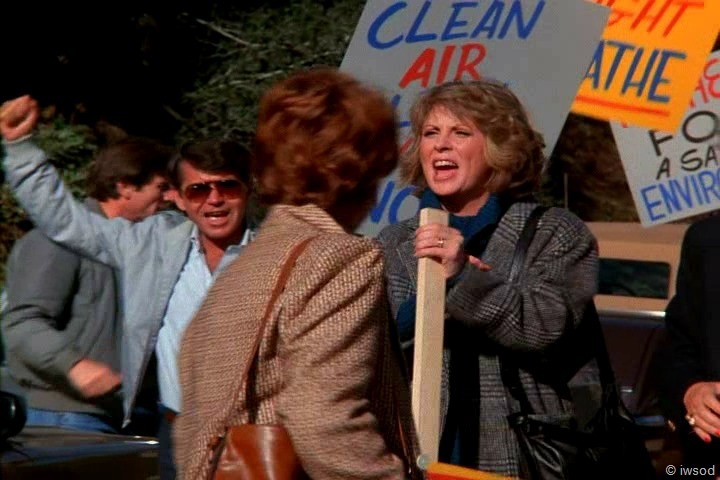 I have to hand it to Mrs. Courtney — she’s got some pretty good protest psychology going on there. “We’re not your enemy. You should be on this side of the fence.” etc. Amanda should definitely put her in charge of MSE recruitment. I think IWSOD this has been the funniest part of the whole episode, I’ve sniggered all the way through reading this. Grrrrr housewives don’t just bake cakes. We make bread. And play with household chemicals, you should see me wield that limescale remover. Condescending much? 😦 good on Mrs Courtney for giving him a load of verbal. I am ROFL at the ID. Lee not only has one but two (why the need for two photographs? ), now that’s just showing off when Amanda has none. Oompa Loompa’s? Too funny, just hilarious! Separated at birth or what! ROFL, Jenbo!! Loved your comment! A costume note: I have found that the episodes when Lee is not wearing a tie may be ones where we are dealing with him opening up a bit more. It may not be that consistent but the European ones Lee grows a lot in his view of Amanda I have noticed. And we have that here as well. The Tie bar is well put away now. Poor Amanda–late to her own party… uh… the protest rally. I love the pink windows in the lab. 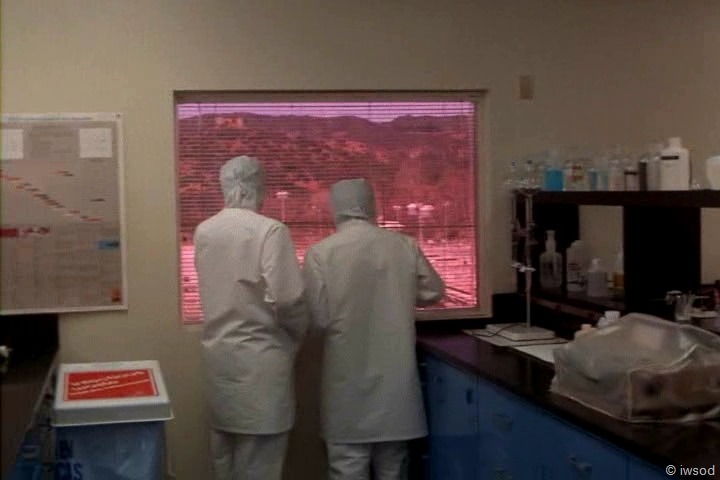 Is that an SMK allegory for the lab people wearing rose-coloured glasses? 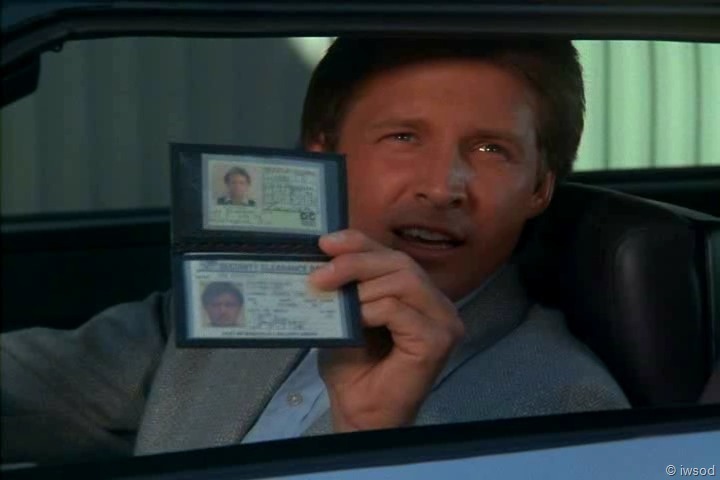 Hey–we see Lee’s ID photo and his second photo… two for the price of one! 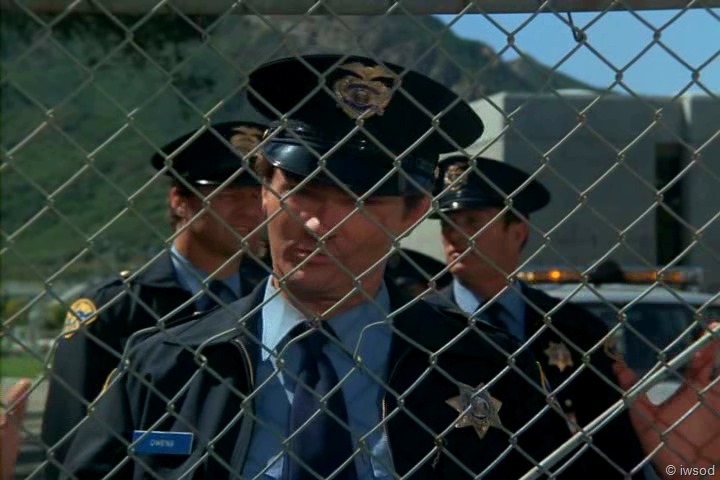 Amanda’s not the only one wearing an already worn outfit–the guards are wearing the uniforms that Lee and co. wore in Burn Out, but with Security Officer patches instead of W Armored Cars… even the hats are the same. Oh KC your comments are too funny! you had me lol’ing!!! 🙂 why not have a laugh over how silly smk is at times.. smk we still love ya! Yeah I thought the whole ‘don’t use force’ was a nod to how the women are fragile and really no great threat- to me it kind of fed into the condescending attitude..
oh good catch on the uniforms!! whooo!! Iwsod, I just knew that you would love the whole ID comment. Amanda really does need to have one. Considering all that she has done and continues to do, it just makes sense. Maybe that’s another foreshadowing into what’s to come down the road. So frustrating to hear the guard comment about baking a cake. I was just as appalled when I first heard it. Women were struggling then to be seen as equals and it just shows how they were being minimized even at this time period. Of course, there are still struggles. 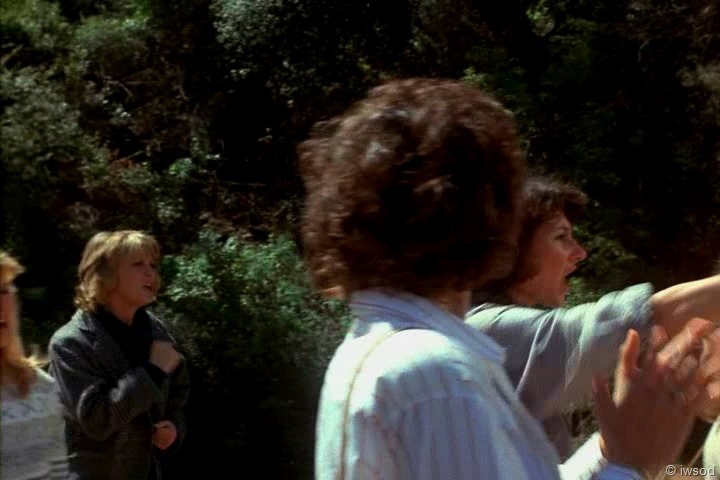 It’s funny how Amanda is following Jean as Lee pulls up and if you look closely you can see her on the other side of the women as Lee is getting to the gate. However, there would have been time for her to get to him before he got through the gate, but it wouldn’t have played into the plot…more holes I guess. 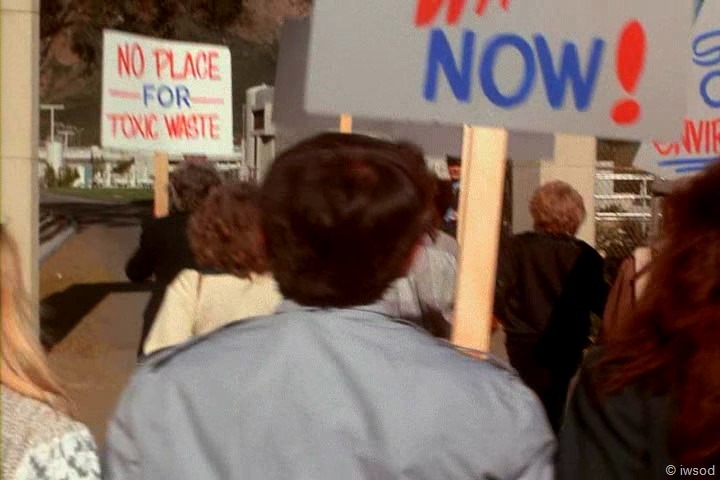 I think I mentioned in an earlier comment about the whole toxic waste and pollution issue and cancer clusters. That was still pretty early so yes, I think SMK was ahead of its time with that. 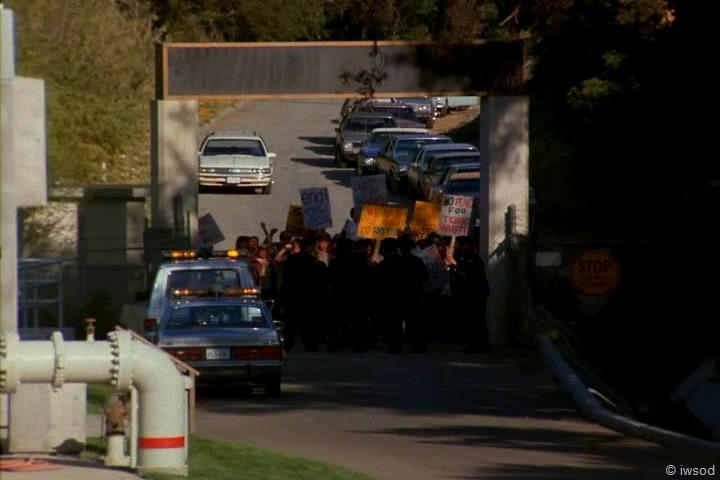 I like how they knew the crystals were at the lab, that help would be needed to get the crystals from the lab, that an insider would be needed to get them from the lab, and that at least one of the protesters would probably be helping to get the crystals from the lab, yet no one from the agency was anywhere near the lab (other than Amanda-who is always on the case). No wonder they were facing budget cuts. Somebody is not on their j-o-b! I’m a bit nervous about when the guest pass goes bye bye! I might have to put up with it for a while yet.. So right.. no one from the agency was even near the lab? lame!!! I agree the environmental slant could have been done well – yeah it was ahead of it’s time.. a shame it wasn’t better thought out though. I don’t think it would have taken much to make me happy. I won’t say for 100%, but I think it’s not until after Stemwinder that she gets an ID. My husband and I are almost through season 3 and it doesn’t look like a picture ID, but I haven’t looked up close at it. I don’t know when that is.. but.. that sounds a way off. oh well I’ll just have to deal with it and I’ll look forward to finding out when it changes. can you make it out?? After the tag in Stemwinder II… and LOL–VIP, indeed!!!!!!!!!!!!!!! Too funny — I love all the commentary on the plot craters (really, these are the people protecting us from the terrorists and other bad guys? I am very, very afraid). And the Oompa Loompa shot? Priceless!